I’m completely done chapter 13–the rest of the chapter is already uploaded and scheduled to post. I’ve also got 5 more pages in chapter 5 that just need Cory to finalize the script and inset the text so I can draw the appropriate word balloons. I’ll only be working on 4 pages this week so that I can guarantee I’ll get everything done on time, but otherwise everything is going great. 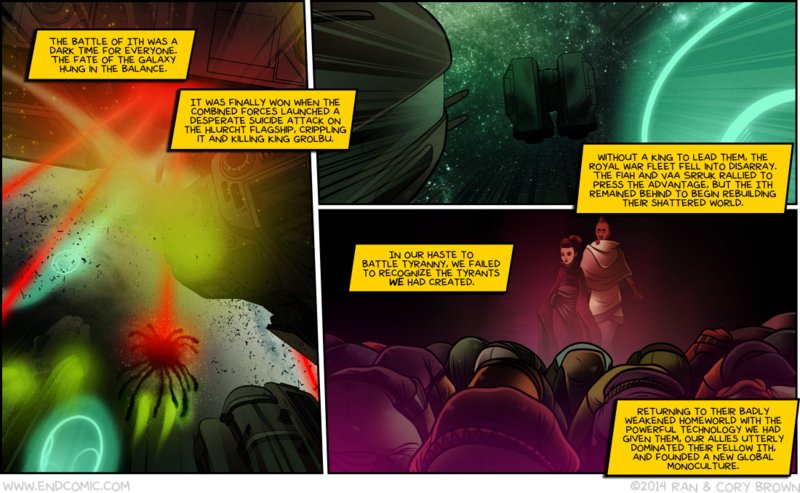 Enjoy today’s page! I’ll be right back at it when I wake up (while at the same time somehow managing to make a fancy dessert for 12 for a family dinner tonight, hahahahah oh god). Anyhow, when I wake up I’ll be doing a bunch of Kickstarter stuff, answering some of my backlog of emails and uploading more cool stuff to patreon. Still looking for a nice way to make alt-text viewable on mobile phones/tablets, if you know of any good ways of doing this, let me know! We recently launched a Patreon! You can find it here. New to Patreon? It’s basically a members only area. 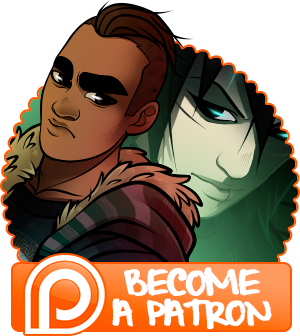 For as little as $1/month, you can have access to our activity feed, which will show pages and other art in progress, give you chapter covers as media packets complete with wallpapers, desktop icons and avatars, world building info and first looks at design work and more. The more you pledge, the more cool stuff you get, including special monthly wallpapers, media packs, art, voting on who that art and wallpapers will features and even one of a kind marker ATC art, mailed directly to your house! Our current goal is to make at least $100/month (we decided to go by month rather than by page because we currently post minimum 8 pages/month, and that’s crazy), and if we reach that goal, we’ll be releasing the full versions of the ESI files from the Intermission chapter, entire chapter thumbnails and versions of pages featuring my terribly awful and wonderful temporary text before Cory inserts the real script. Check out a preview of this month’s pin-up art, featuring Samira and Maxwell! 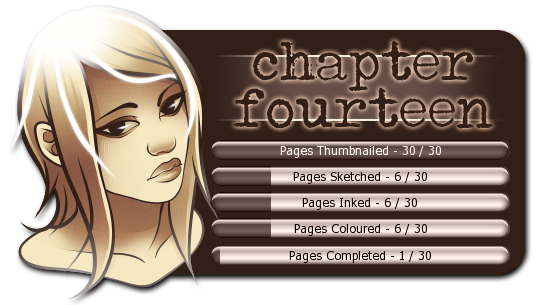 Previews of pages 1-5 of chapter 14, flatted and ready to be coloured! Don’t forget to cast your vote on who the first monthly wallpaper will feature! You can vote for anyone! Later today I’ll be posting some full colour panels from the batch of pages I just coloured, if you’re interested.